After much success with our RAGE Rescue program, we've decided to continue helping local pups find homes by featuring more dogs from DFW Rescue Me. We'll call this blog item "Canine Corner", and we'll post an available dog each week. 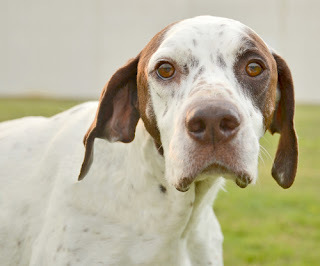 Sparty is a two-year-old German Shorthaired Pointer. He's deaf, but he doesn't let that hold him back! He gets along great with other dogs, and his gentle, quiet nature makes him perfect for cats and kids too. Sparty is a little shy when he first meets you, but he warms up very quickly and he'll soon be your best friend! Sparty is up-to-date on all shots and vaccinations. Plus, he's already neutered. He's also housebroken and crate-trained. Sparty would make an ideal pet! If you'd like to know more about sweet Sparty, please click here.